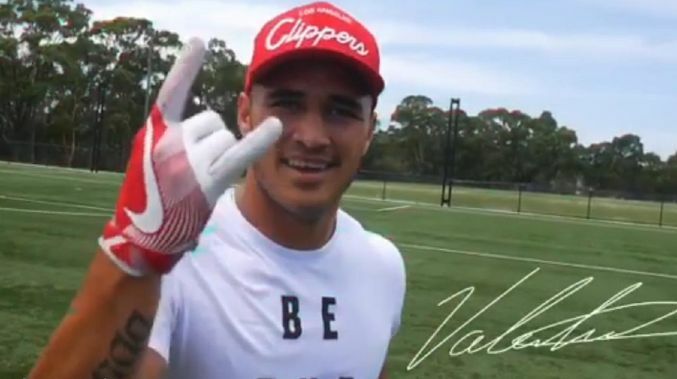 Valentine Holmes is headed to the New York Jets after accepting a place in the NFL’s International Pathway Program. The NFL announced on Tuesday morning that Holmes was allocated a spot with the Jets however under the pathway program rules the Australian won’t be eligible to play in the NFL in the 2019 season. Holmes is one of seven international players from five different countries who have been training at Florida’s IMG Academy the past three months. In the past 24 hours three of those players were added to teams, former England and British and Irish Lions rugby player Christian Wade (Buffalo Bills), former Brazilian judo champion Durval Neto (Miami Dolphins) and German tight end Jakob Johnson (New England Patriots). That left the Jets as the remaining option. After training as a running back, wide-receiver and punt/kick returner he’ll now learn from arguably the best receiving back in the league in Bell, after his controversial exit from the Pittsburgh Steelers. IPP players are assigned to a team’s practice squad — and can be kept on the squad after training camp without counting in the 10-man limit. They would need to be promoted to the 53-man active roster to be eligible to play. Holmes will have the opportunity to prove his value as he prepares to head immediately to Jets training to begin preparing for preseason games. Practice squad players earn far less than what Holmes can earn in rugby league so he’s betting on his talent.